Worlds will live. Worlds will die. And the DC Universe will never be the same. While the Secret Wars was cool, The Crisis was deep and huge and sweeping. It was epic. 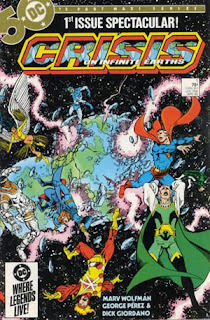 George Perez's art was panoramic. Marv Wolman's writing put the heroes on the ropes and the villains had very little choice but to help out. After all, the Anit-Monitor wanted to destroy the Multiverse. And he was winning. We watched Barry Allen sacrifice himself. Supergirl fell in battle, at Kal-El's side. Wonder Woman was returned to mere clay. Whole Universe's winked out, in the blink of an eye. We even got to see Batman FRIGHTENED after seeing the ghost of the Flash crying for his help. The Dark Knight was scared. This was doomsday. This was the end. And it was. DC's Multiverse died, that year. Yeah, I know that eventually it came back, but it took two decades. That's an eternity in the comics business. As a young fan of continuity, having a single universe sounds great. In theory. But part of DC's charm is some of the whacky origins that a Multiverse makes possible. It would take time for me to realize this, but in the meantime, I got the treat of picking up a masterwork from the minds of Wolfman and Perez off of the rack, each month. Crisis fulfilled it's promises. It ended with a bang. But, more importably, it was also a beginning. 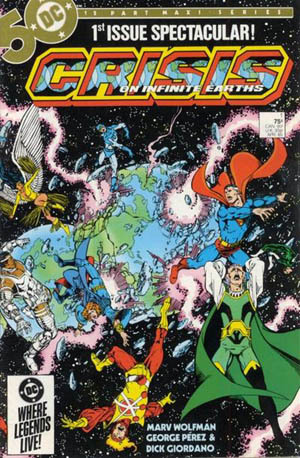 Crisis on Infinite Earths was hands down the biggest thing in comics. Ever. It made me proud that I was a DC Fan instead of a Marvel fan then (I went back and forth). It was at a great time too. I was reading a lot of Moorcock and sci-fi about multiple universes. To me this was opera. Big, Epic and not done till it was done and when the ashes settled you had no idea who was standing. They killed Supergirl! The killed the Flash! And Barry stayed dead till just recently. It was huge. I enjoyed every minute of it.